On Sunday (St. Patrick's Day) I shared a giveaway and special promotion for Darina Allen's latest cookbook, Simply Delicious: The Classic Collection: 100 Timeless Tried & Tested Recipes. Darina runs the world-renowned cooking school at Ballymaloe in County Cork, Ireland. She founded the school with her brother, Rory O'Connell in 1983 and since then has authored many cookery books. Besides running the school with her brother, her daughter-in-law, Rachel Allen, also teaches there and lives nearby. The school maintains a dedicated staff that number approximately 55 which insures that the Allen dynasty will live on for generations. 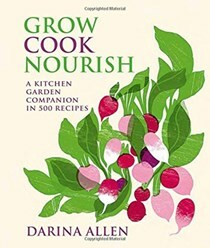 In January of last year, I reviewed Darina's Grow, Cook, Nourish which details the history of the Allen family which began with Myrtle Allen (be sure to check the end of this post for information regarding a special celebration of this matriarch's life coming up the first weekend in April). Recently, I had the pleasure of speaking with Darina and her spirit and exuberance for Ireland, food and cooking reached through the phone and captured my heart. She clearly loves Ballymaloe and by the time we parted ways, I was in love with this magical place. I shared on social media how lovely it was to speak to Darina and was met with countless stories of others' similar experiences with this special lady. Ballymaloe Cookery School, founded in 1983, is a multi-award-winning establishment that provides a first class culinary education to students from all over the world. The Allens are proud of their long-standing tradition of excellence and their Slow Food philosophy. The school's prestigious 12-Week Certificate is internationally recognised and has been the first step of the culinary journey of many well-known chefs, food producers and food writers worldwide. The culinary elite are not the only students that the school caters to - anyone wishing to learn to cook, whether it be for a short-term course, an afternoon workshop or a full three-month program, are welcomed. Each year the school invites distinguished guest chefs to participate in their school curriculum. My husband, whose mother's maiden name was O'Hara, was known for saying "There are two types of people in the world, those who are Irish and those who wish they were". Ireland is beautiful and everyone claims Irish heritage on St. Patrick's Day but for years it wasn't an accomplishment to state you were an Irish cook. Decades ago, Irish cuisine had a reputation for being what I refer to as the three B's - boiled, bland and boring (and one could throw beige in there for good measure). Darina and I spoke about the culinary transformation that has occurred since she first began writing cookbooks thirty years ago. Not only has cuisine changed worldwide, but particularly in Ireland where a remarkable metamorphosis has taken place. Today's Ireland is one filled with artisanal food producers, Michelin starred restaurants, fishermen who are smoking fish to deliciousness, and home to world class produce. Ireland is the Emerald Isle surrounded by water which makes seafood abundant and the lush grass provides nourishing pastures for the beef and lamb raised there. We mustn't forget the legacy of Kerrygold butter, Ireland's gift to bakers and butter lovers everywhere. Ballymaloe Cookery School is home to a 100-acre organic farm with a greenhouse, 600 chickens that are fed the scraps from the morning's breakfast, cows that provide the dairy to make butter and other products, and countless varieties of produce. I asked Darina what advice she would give to novice gardeners. Her advice is profoundly simple: gather seeds, add light, water, and patience and you will create magic. She suggests that working with our children to sow seeds is something that can help them learn how things grow but also appreciate vegetables. Taking back control of what we grow and eat is why she feels that Grow, Cook, Nourish is her most important book to date. It certainly is one of my most favorite books. Darina Allen has written 18 plus cookbooks as well as a column at the Irish Examiner which she has managed to do all in longhand. She has never taken to the computer and has someone type up her work. She loves to write and has another cookbook in the pipeline coming this September, One Pot Feeds All. This new title will feature easy, nourishing meals that can be whipped together with minimal mess and one pot. Just as Darina inspires thousands of cooks worldwide, she finds inspiration from chefs who create beautiful simple food such as Alice Waters and Maggi Beer. When in New York, she enjoys the menu at Chez Ma Tante in Brooklyn and Buvette (Jody Williams' cookbook is fantastic). Of course, we talked cookbooks. The cookbook library at the school has several thousand cookbooks. A portion of their collection has already been added to the Ballymaloe Cooking School's bookshelf here at Eat Your Books. Darina reminds us that the school operates all year and for those visiting Ireland there are afternoon classes available for tourists to pop in and try a few recipes, see a demo and have a taste of their Ireland. Accommodations for the school are convenient including the historic Ballymaloe House which is just two miles from the cookery school. Ballymaloe House started a revolution in Ireland in 1964 by then 40 year old housewife, Myrtle Allen. After a remarkable life spanning 96 years, Myrtle passed away in June of 2018. A documentary available for viewing on the website shares Myrtle's story. A 2 1/2 day 'Tribute to Mrs. Allen', cooking course at the Ballymaloe Cookery School from April 1st to the 3rd is planned. It will include dinner at Ballymaloe House and a talk by food historian, Regina Sexton on the impact Myrtle had on the Irish Food Scene and on the image of Irish Food worldwide. More information can be found on the website. Recently, Darina was on NPR and I wanted to be sure our members checked out that piece. Special thanks to Darina for her time and generosity. Photos above were taken from the Ballymaloe website. Darina's photo with her hands covered in the rich soil of Ballymalore reflects clearly her love for food sustainability and Ireland. Great overview of Darina Allen's accomplishments and passions. So thrilled a new book is coming soon. Love this. That photo of her is wonderful! Great to see your coverage and the love comes through. Well done.